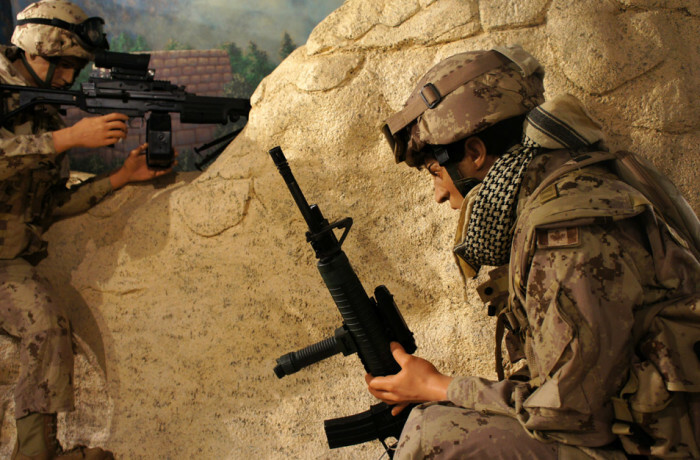 During the first half of 2007 much of Task Force 1-07 came from CFB Gagetown, including the battle group provided by the 2nd Battalion of The Royal Canadian Regiment. During the tour elements of the battle group engaged in numerous fire-fights with the Taliban in the rugged area of Kandahar province. Troops also encountered IED (Improvised Explosive Device) attacks. On April 11, 2007, Master Corporal Allan Stewart of Newcastle, NB and Trooper Patrick James Pentland of Geary, NB, both from the Royal Canadian Dragoons, were killed in an IED attack. ©2019 NB Military History Museum.